Do You Think Your Computer Is Secure with the Latest Antivirus or Antispyware Program? What is System Protect for? 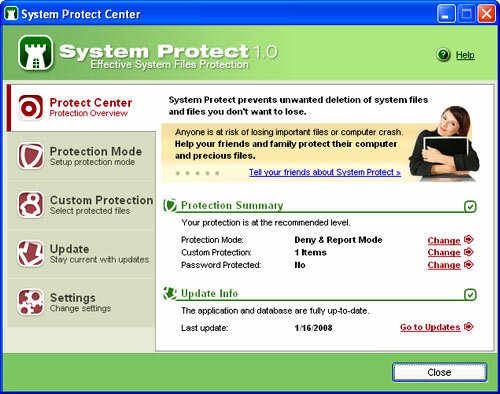 System Protect is free, easy-to-use software that helps keep your operating system stable and protect important programs, documents and files from deletion caused by viruses, other users on your computer such as your kids, or even by your own mistake. It also guards your system and application files and doesn't allow anyone, even antivirus programs to delete or modify them. System Protect prevents deletion of important system files whose loss could cause your operating system to crash. These files could be attacked by viruses or accidentally deleted by you or your kids, or antivirus programs. Even developers of security programs make mistakes. Millions of computers have already been destroyed by security applications. System Protect guards your system files and does not allow anyone to delete or modify them. System Protect allows you to pick files and folders that you want to protect from deletion such as important documents, your favorite music, photos from your vacation, movies or any other files that you do not want to lose. System Protect alerts you to any attempt to delete or modify protected system and selected files, and automatically blocks the attempt or lets you decide whether you want to allow this attempt or block it.